My posts on the equations of motion of the runner on Jan 16th and Feb 6th led to an intense discussion which included some very thought provoking comments by several readers, including Ewen, Simon, Robert, Mike, and Klas. In essence, the discussion led to the conclusion that the calculations themselves provide an accurate account of the mechanical energy costs of the braking that is inevitable when the point of support is in front of the centre of gravity (COG), and the cost of elevating the body to become airborne. However, these costs are not the only costs that need to be considered. The other main mechanical cost is the cost of repositioning the limbs relative to the COG, In addition, possible variations in the efficiency of conversion of metabolic energy to mechanical energy, and the efficiency of recovery of energy via elastic recoil must be considered. Furthermore, factors such as wind resistance and variation in the profile of the time course of the pressure that the foot exerts upon the ground (and the opposing ground reaction force, GRF) should be borne in mind. A complete account of the energy costs of running needs to take account of all of these factors. I believe it is possible to deal adequately with effects of wind residence and variation in the profile of the time course of GRF, and I plan to do this in future posts. I am confident that these factors play only a relatively minor role under many circumstances. Unfortunately, variation in the costs of repositioning the limbs; the efficiency of metabolic to mechanical conversion; and the efficiency of elastic recoil are difficult to estimate precisely but would be expected to play a key role under some circumstances. Nonetheless, I believe that for the range of time on stance, cadence and speed that I considered in my calculations, the changes in braking costs and the costs of elevating the body that are achieved by adjusting cadence and time on stance the most important factors to consider. A full justification of this claim would require more detailed information about repositioning costs, efficiency of metabolic to mechanical conversion and elastic recoil than are currently available. In future posts I will also review what is known about each of these factors in detail. My goal in this post is to provide an outline of why I think that variation in cost of braking and elevation of the body are the most important issues in the circumstances discussed in my posts on 16th Jan and 6th Feb, and furthermore, to provide an indication of the range of running speeds over which my conclusions likely to be valid. The largest of the repositioning costs is the energy required to move the leg forward relative to the COG during the swing phase. Muscles must do work accelerating the foot from a stationary position on the ground to a speed approaching twice the running speed by mid-swing, to allow the foot to overtake the torso and get ahead of the COG by foot-fall. Factors such as elastic recoil of the hip flexors which were stretched in late stance will contribute to the forward propulsion of the leg. After mid-swing, the leg decelerates so some of the energy imparted initially might be recovered as the leg pulls the torso forwards. Nonetheless, due to inefficiency neither elastic recoil of the hip flexors nor the momentum of the swinging leg will meet all of the cost. We can obtain a crude estimate of the magnitude of repositioning costs by applying Newton’s laws of motion estimate the mechanical cost of accelerating the leg forwards during the first half of swing. The work that is done in accelerating an object is proportional to the integral of force times velocity over the time period for which the force acts. If we assume that the acceleration is uniform, it can readily be demonstrated using Newton’s laws, that the work done is proportional to the square of the running speed and inversely proportional to the duration of the swing. Thus the repositioning cost will increase rapidly as running speed increases. It will also increase as cadence increases since swing time decreases as cadence increases, assuming a constant proportion of time is spent on stance (which is the case if the peak vertical GRF is fixed). Furthermore, at fixed cadence, swing time decreases as time on stance increases, so increasing stance time will result in greater repositioning cost. For the situation considered in my post on Feb 6th, in which cadence increased from 180 to 200 steps per minute, while both velocity peak vGRF and hence proportion of timer spent on stance remained constant, the repositioning cost would be expected to increase by 11 per cent (20/180). For the situation considered in my post on Jan 16th, running speed averaged over the gait cycle remained constant and cadence remained constant at 180 steps per minute, while peak vGRF/Kg increased from 2g to 4g. Time on stance decreased from 262 milliseconds to 131 milliseconds while swing time increased from 404 milliseconds to 535 milliseconds. Thus, repositioning costs would be expected to decrease by 32% (131/404). Although the assumption of uniform acceleration is an approximation that would make any estimate of actual energy cost unreliable, the estimate of the proportional change is likely to be a reasonably reliable guide for our present purpose. The most important issue is the direction of change in repositioning costs: namely at constant cadence, the repositioning costs decrease as peak vGRF increases and stance time decreases; while at constant vGRF, the repositioning costs increase as cadence increases. What proportion of the total mechanical costs can be attributed to repositioning the limbs when running speed is 4 m/sec? As we have seen repositioning cost increase as the square of the running speed. This was confirmed by Cavagna and Kaneko (J. Phy8iol. (1977), 268, pp. 467-481) by direct measurement of the motion of the limbs recorded on cine films. Furthermore, C&K demonstrated that for runners who were running using their preferred running style at various speeds, that the repositioning costs were equal to the sum of braking and elevation costs at a speed of 20 Km/hour (5.5 m/sec). At 4 m/sec, the cost of repositioning the limbs was 37% of the total mechanical costs. Thus, when vGRF is kept constant while cadence increases from 180 to 200 steps per minute, the repositioning costs would be expected to increase the total mechanical work costs by about 4% (11% of 37%). In my computation presented on Feb 6th, I demonstrated that the combined cost of braking and elevation diminished by about 10% (ie about 6.3% of total mechanical costs) as cadence increased from 180 to 200 steps per minute (at speed of 4 m/sec and peak vGRF/Kg = 3g). Thus the gain in mechanical efficiency achieved by increasing cadence is only a little greater than the added repositioning cost. It is clear that at speeds much faster than 4 m/sec, the gain in mechanical efficiency obtained by increasing cadence is likely to be obliterated by the increased repositioning costs. On the other hand, at slower speeds the gains from increasing cadence would be expected to be appreciable. Furthermore, at lower vales of peak vGRF which are associated with longer times on stance, the gains from increasing cadence would also be greater. So, in summary, at a speed of 4 m/sec and vGRF/Km = 3g, a small gain in mechanical efficiency would be expected when cadence increases from 180 to 200 steps per minute. However at higher speed or higher peak vGRF the gain from reduced braking would be offset by the increased repositioning costs. (Although I have not done the relevant calculations, even at 5.5 m/sec, where reposition cost is equal to the sum of braking and elevation cost, a net gain might be expected from increased cadence but it would be very small). In contrast, at lower speeds and/or lower peak vGRF, worthwhile gains in efficiency might be expected as cadence increases. In the situation considered in my post on Jan 16th, there was a 21% decrease in the braking and elevation costs as peak vGRF/Kg increases from 2g to 4g at constant cadence of 180. Based on Cavagna and Kaneko’s data, this represents a 13% saving in total mechanical cost. As we have seen in the above estimate, repositioning costs will be expected to decrease by about 32%. Since the C&K data indicate that repositioning cost are 37% of total mechanical costs at this speed, the reduced repositioning cost would be expected to produce a 12% saving in total mechanical costs. Thus when vGRF increases (and stance time decreases), the gain in efficiency for reduced braking is augmented by a gain of similar magnitude from reduced repositioning costs. At higher speeds, an even greater proportional gain in efficiency would be expected from increasing vGRF. Although the numbers employed in these calculations are only approximate estimates, the general conclusions are likely to be valid. At 4 m/sec, increasing vGRF (and decreasing time on stance) at constant cadence produces an appreciable gain in efficiency due to reduced braking costs accompanied by reduced repositioning costs. Increasing cadence from 180 to 200 steps /minute produces only a small improvement in efficiency due to the counter-productive increase in repositioning costs. 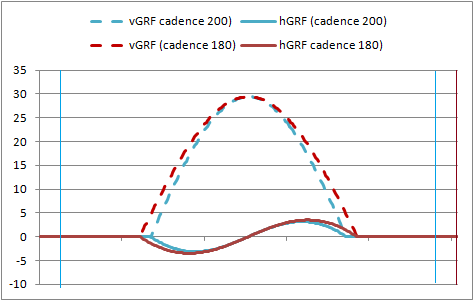 At higher speeds, the gains from increasing vGRF would be expected to be even greater, while the gains from increasing cadence would be minimal. In contrast at lower speeds the gains from increasing cadence would be expected to be appreciable. Effect of increasing vGRF at very slow speeds. As discussed in my post on Jan 16, as vGRF increases at constant cadence, braking costs decrease while elevation costs increase. At 4 m/sec, the gain from reduced braking cost is substantially greater than the extra elevation cost, so the combined mechanical cost of braking and elevation decreases as vGRF increases. However, at very slow speeds, the distance travelled while on stance is very small and the work that must be done to compensate or braking is much less, so braking costs are a lesser proportion of total mechanical costs. However, elevation costs (per step) for a given peak vGRF are almost independent of speed. (This emerged from the equations of motion and was confirmed experimentally by C&K.) This at very low speed, the combined cost of braking and elevation will actually increase as vGRF decreases. For example, in my response on 27th Feb to a comment by Klas on my post of Jan 16th, I presented results demonstrating that at a speed of 2.5 m/sec, combined cost of braking and elevation is actually greater when vGRF/Km =4g compared with 2g. Furthermore, at such a low speed, repositioning cost are very small. Therefore, at speed as slow as 2.5 m/sec, increasing vGRF produces no appreciable gain in mechanical efficiency. I should also be noted that even at higher speeds, once stance time becomes extremely short, braking costs will be low compared with elevation costs and further reduction in time on stance will result in an increase in the combined cost of braking and elevation. Efficiency of conversion from metabolic to mechanical energy. The efficiency with which muscle contraction converts metabolic energy to mechanical energy is typically around 20% or even less in some circumstances. The largest contribution to this is the inefficiency of the biochemical process by which fuel is burned to produce the energy molecule ATP which proves energy to the contractile machinery of the muscle fibre. This process has an efficiency of only 40%. Unfortunately, no adjustment of running style can improve this biochemical inefficiency. However the efficiency of processes by which the molecular machinery within muscle fibre generates force is potentially amenable to change. Muscles contract by a ratcheting action between filamentous actin and myosin molecules within the muscle fibre. The efficiency of this ratcheting depends on the rate of shortening of the muscle. There is a certain fairly narrow range of contraction speeds at which the interaction between actin and myosin is optimally efficient. Efficiency falls away rapidly when contraction speed is less the optimal range, and falls away somewhat less rapidly as contraction speed increases above the optimal. Different fibre types have different optimal speeds. As might be expected, slow twitch (type 1) fibres are optimally efficient at slower speed of contraction than fast twitch (type 2) fibres. The optimal contraction speeds for these two fibre types differ by a factor of about two. There appears to be a neural mechanical hat ensures that type of fibres that are recruited for a task depends on the demands of the task. Hence, at least for a professional athlete who has the opportunity to train whichever type of fibre is most relevant to his/her event, it would appear that the best strategy is to train the fibres that are most suited to achieving optimal mechanical efficiency. Maybe a recreational runner might be better advised to adjust factors such as peak vGRF to match the fibres that are available for the task. Furthermore, the efficiency of metabolic to mechanical efficiency conversion diminishes as a muscle becomes fatigued (C.J.Barclay, Journal of Physiology (1996), 497.3, pp.781-794). Therefore, at least for a recreational runner, it might be better to adjust vGRF to a somewhat lower value than that which provides optimal mechanical efficiency, so as to increase the recruitment of the more fatigue resistant slow twitch fibres. The tendency for marathon runners to increase time on stance in the later stage of the race might reflect the need to rely almost entirely on slow twitch fibres in the later stages of the race. In summary, it seems to me that preferred strategy is to train to produce adequate fatigue resistance in the fibres that are best suited to achieving optimal mechanical efficiency. However if one has less opportunity to train, or when racing over a distance that is longer than usual, it might make sense to increase time on stance to maximise the efficacy of conversion of metabolic energy to mechanical work despite some loss of mechanical efficiency. The elasticity of tendons increases as the rate of application of force increases, so in general, the efficiency of elastic recoil of the tendon itself would be expected to be greater at shorter times on stance, though the as the rate of application of force increases a plateau would eventually be reached. However, perhaps more important than the plateau at high loading rates is the fact that recoil is a product of the concerted action of muscle and tendon. Tension is only created if the muscle contracts as the muscle-tendon unit is stretched. Therefore, if the rate of application of force is potentially too great for the muscle to bear without damage, it is likely that a protective mechanism will limit the amount of tension that is developed. Thus, it would be expected that the efficiency of elastic recoil will increase as time on stance decreases, but beyond a certain point the strength of the muscle contraction will cease to increase, and tension will no longer rise in proportion to the applied force. Thus elastic recoil will capture a smaller proportion of the energy of impact. I do not know of any measurements that establish the rate of loading that achieves maximum efficiency of elastic recoil during running. However, as in the above consideration of metabolic to mechanical conversion efficiency, it would appear that the ideal strategy for optimal efficiency is to develop muscle strength to the level required to cope with the loading rate required to give maximum mechanical efficiency. These considerations suggest that the optimum strategy is to develop both strength and fatigue resistance of muscle fibres to a sufficient degree to allow the achievement of optimum mechanical efficiency. However in practice this might not be feasible, especially for recreational runners. In such situations it might be more efficient to adopt a somewhat longer time on stance even it this results in sacrifice some mechanical efficiency. At running speeds around 4 m/sec or higher, the greatest mechanical efficiency is likely to be achieved by aiming for a relatively short time on stance, achieved by employing a greater peak vGRF. Furthermore, increasing cadence from 180 to 200 steps per minute would also be expected to produce a small some gain in efficiency, but the increased cost of repositioning the limbs nullifies some of the potential gain from reduced braking cost. At higher speeds, this antagonism of the potential benefit of increased cadence becomes even more marked. The increased in peak vGRF required to achieve a shorter time on stance (at constant cadence) comes the price of greater stress on the muscles. At least for the recreational runner, and perhaps even for professional athletes running very long distances, it might be preferable to sacrifice some of the potential gain in mechanical efficiency by employing a somewhat longer time on stance. In my post of 16th Jan I presented results of a calculation of the work required between mid-stance and the achievement of peak height in the subsequent airborne phase to elevate the body from it’s low point at mid-stance, and to overcome the effect of braking in the first half of stance. These calculations were based on a precise solution of the equations of motion for the centre of gravity (COG) of the runner’s body derived from Newton’s Laws of motion. The comments by Ewen, Simon, Robert and Mike led to an extensive discussion of issues related to my calculations and the conclusions that I drew. Here I will attempt a summary of the major issues that we discussed, including the evidence for validity of the calculations. There are two assumptions implicit in my calculations. First, that the time course of the vertical component of ground reaction force varies sinusoidally with time during stance (as shown in fig 1 of that post). As can be seen by comparing figure 1 with force plate data (eg Figure 1c in the paper by Daniel Lieberman and colleagues, Nature, Vol 463,p 531, January 2010) this is a fairly good approximation to force plate data for a forefoot runner. Secondly, that the tension in the leg muscles is adjusted to ensure that the total ground reaction force acts in the direction of the line form point support to the centre of gravity (COG). This assumption is also supported by observational data, as outlined in the discussion between Simon and myself in the final few comments on that posting (dated 31st Jan). There were also two energy costs that I had ignored in my calculations: the effect of wind resistance and the effect energy consumed in re-positioning the limbs during the gait cycle. In his comment on 22nd Jan, Robert kindly provided a fairly realistic estimate of the effect of wind resistance and demonstrated that for the examples that I was considering, the effect of wind resistance due to the runner’s own velocity through still air, as likely to be small. I myself carried out some crude experiments to determine the energy cost of re-positioning the limbs, and demonstrated that these costs were fairly small and unlikely to alter the conclusions that I had drawn. However the cost of repositioning limbs does increase with running velocity and the energy cost of repositioning the limbs is likely to be appreciable at higher running velocities. I will discuss this issue in more detail later in this posting. Overall, the outcome of quite intensive discussion arising from comments by Robert, Simon and Mike is that the computation is likely to be a fairly good representation of the displacements, velocities and energy required to elevate the body and overcome braking in the case of a forefoot runner. The main conclusion I had drawn was that the energy costs (for a given velocity and cadence) are lower when the time on stance is shorter. In general a shorter time on stance can be achieved by maintain greater tension in the leg muscles so that the amount of flexion at hip and knee is reduced. The intense discussion in the comment section helped consolidate my confidence that this is a valid conclusion. The most hotly debated issue in the comments on my post was the implications of my calculations for rotational effects occurring during the gait cycle, and in particular for the controversial concept of gravitational torque. In fact my model does provide a very clear answer regarding rotational effects. There is indeed an increase in the angular momentum about a pivot point at the point of support in a head forward and down direction during the second half of stance, though the question of whether these should be described a consequence of gravitational torque is more debateable. In the absence of wind resistance, this effect is cancelled by an opposite effect in the first half of stance, and I do not believe that this issue is of major importance in understanding running mechanics. However, because it has been a bone of contention in relation to the theory underlying the Pose technique, I will devote a post to that topic in the near future. Meanwhile, in this post I wish to deal with two issues. First is the issue of cadence. The second is a discussion of the energy costs of repositioning the limbs. It is widely believed that increased cadence is associated with greater efficiency. The energy cost (per mile or Km) of elevating the body to the peak height in the airborne phase decreases with increasing cadence. This is because the duration of each gait cycle decreases as cadence increases. The amount of gravitational potential energy lost when a body falls is proportional to the square of the duration of the fall. Even though the number of steps per mile (or Km) increases linearly as cadence increases, because the energy saving is proportional to the change in the square of the duration, the energy saving more than offsets the increase cost due to an increase in number of steps. As demonstrated in my post of 16th Jan, the equations of motion of the runner’s body provide a precise estimate of the elevation that occurs from mid-stance to peak height, and hence provide a precise estimate of the energy cost of elevating the body These equations also provide a good estimate of the energy required to overcome braking in early stance, provided data for hGRF is available as a result of either direct measurement or estimation based on vGRF (equation 5 on the calculations page). 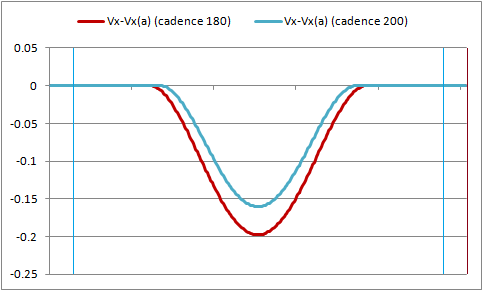 In this post, I report the result of using these equations to examine the effect of increasing cadence, while maintaining a specified peak vGRF. I have performed the calculation assuming a peak value of vGRF of 3g per Kg. This value is midway between the two different values of peak vGRF I considered in my previous post, and is likely to be a fairly realistic estimate form many runners when running at 4 m/sec. Figures 3 to 5 (numbered sequentially from the figures in my post of 16th Jan) illustrate the braking effect and also the vertical displacement of the COG during the entire gait cycle, for the case where peak vGRF is 3g per Kg, for a cadence of 180 steps/sec and 200 steps/sec. 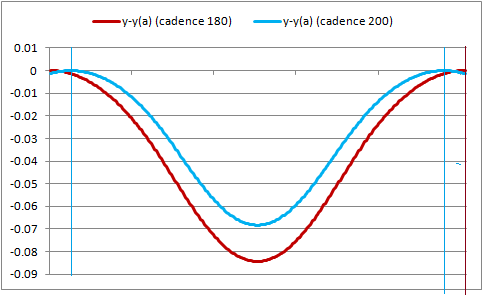 As expected, the vertical displacement is less at higher cadence. There is a 19% reduction in the vertical displacement (and hence a 19% reduction in energy required to elevate the body in each stride), whereas the number of strides per mile (or Km) increases by only 11%. Thus the energy consumption per mile (or Km) is about 8% less at 200 steps per minute compared with 180 steps per minute. Fig. 4: Change in height of the COG from mid-airborne phase (in metres) when peak vGRF= 3*g Newton/Kg, for cadence 180 steps/minute (ochre) and 200 steps per minute (blue), at velocity 4 m/sec. Vertical blue lines indicate mid-airborne phase for cadence 200. Fig. 5: Change horizontal velocity from mid-airborne phase (in metres/sec) due to braking when peak vGRF= 3*g Newton/Kg, for cadence 180 steps/minute (ochre) and 200 steps per minute (blue), at velocity 4 m/sec. Vertical blue lines indicate mid-airborne phase for cadence 200. There is also a saving in the energy required to overcome the braking effect. The duration of braking is shorter, due to the shorter overall gait cycle and associated shorter time on stance. Furthermore, the leg is less oblique at footfall when cadence is greater and consequently the horizontal component of GRF is less. As a result of both of these factors, the braking effect is less. Table 2 gives the energy costs of braking, elevation and total costs for a forefoot runner, running at 4 m/sec and peak vGRF = 3g per Kg for a cadence of 180 and 200 steps/min. The energy at the higher cadence saving amounts to approximately 14%. Table 2: Mechanical work per Km per Kg required to overcome braking and to elevate the body, when peak vGRF=3*g per Kg, velocity = 4 m/sec. A similar calculation performed for the situation where peak vGRF = 2g /Kg indicates reduction in energy cost from 1309 Nm/Km at cadence 180 steps per minute to 1186 Nm per Km at 200 steps per minute. Thus the saving is even greater when peak vGRF is lower (relatively longer time on stance) because the increased braking with greater obliquity of the leg at footfall is even greater at lower values of peak vGRF. How do the estimated energy costs compare with directly measured metabolic costs? It is of interest to compare these estimates of the costs of overcoming braking and elevating the body with evidence regarding the metabolic cost of running at 4 m/sec, though there are two uncertain quantities in determining the metabolic cost of achieving a specified amount of mechanical work to metabolic costs. The first is the fact that muscle contraction is a relatively inefficient way of converting metabolic energy to mechanical energy. It is generally accepted that during activities such as running and cycling, muscle contraction has an efficiency of approximately 20% (i.e the consumption of metabolic energy by muscle contraction is 5 times the amount of mechanical work done). Secondly, when running a proportion of the energy required to overcome braking and elevate the body is derived via elastic recoil of muscles and tendons. I am not aware of any data for the proportion of energy recovered by elastic recoil. For present purposes, I assume that 50% of the energy can be obtained via elastic recoil. Because the elasticity of tendons in greatest when that are loaded rapidly, this proportion is likely to be higher when the rate of loading of the muscles and tendons in early stance is highest. According to the data published by McArdle in 2000 (Essentials of Exercise Physiology, USA: Lippincott Williams and Wilkins, 2nd ed. p170) the total metabolic energy cost of running at 4 m/sec is 62.2 Kcal/Km or 0.99 Kcal/Km per Kg (4142 Nm/Km per Kg). It is usually considered that this cost varies relatively little with variation in gait. While my calculation show that energy costs do vary appreciably with duration of time on stance, for the purpose of obtaining an approximate estimate of the relative proportion of total energy spent on elevating the body and compensating for braking, we only require an approximate estimate of total cost. If we assume the efficiency of conversion of metabolic energy to mechanical work is 20%, while 50% of the energy can be recovered by elastic recoil, McArdle’s data indicates that the mechanical work done 1656 Nm/Km/Kg. This is of course a crude estate and makes no allowance for the fact that time and stance and cadence produce modest but appreciable changes in energy cost. Alternatively, using Daniels’ formula for oxygen consumption at paces in the aerobic zone, it can readily be shown that for a runner with VO2max of 51 ml/min/Kg, running at 4 m/sec (which is in the upper aerobic zone where energy is largely provided by metabolism of glucose (derived from glycogen) oxygen consumption is consumption 188 ml/Km per Kg. When glucose is the fuel, 1 litre of oxygen provides 5.05 Kcal, giving a metabolic cost of 0.95 Kcal/Km per Kg, and corresponding mechanical energy cost of 1589 Nm /Km/Kg . Thus Daniels’ data indicates a metabolic cost about 4% lower than that derived from McArdle’s data, but this difference is trivial in light of the uncertainties in estimating mechanical cost from metabolic cost. The important conclusion is that whether one uses an estimate based on Daniels or McArdle, it is clear from the data shown in tables 1 and 2 (which indicate mechanical costs in the range 1180 Nm to 1400 Nm per Km per Kg) that elevating the body and overcoming braking, make a major contribution to the energy cost of running, Provided one starts with accurate data for GRF, it is possible to compute the mechanical work required to overcome braking and to elevate the body quite precisely, using Newton’s laws of motion (as indicated in my calculations page). Assuming a sinusoidal time course of vGRF, the results are as presented in this posting and my post on 16th. Nonetheless, the comparison with the data derived from McArdle or Daniels does indicate that there is some minor but nonetheless appreciable energy cost in addition to elevating the body and overcoming braking. As mentioned above, the other appreciable energy cost of running is the energy required to re-position the limbs, especially the legs. The foot must be accelerated from a stationary position on stance to a velocity somewhat greater than the velocity of the torso, so that it overtake the torso, by mid-swing, and then decelerates during late swing so that is near to zero relative to the ground at foot-fall. In the discussion following my posting of 16 Jan, I described a crude estimate of the energy required to reposition the limbs based on estimate of the increased metabolic demand, based on measurement of increased heat rate, when I executed the arm and leg movements associated with repositioning the limbs, The estimated cost of repositioning the limbs at pace of 4 m/sec and cadence 180 steps per minute was 0.28 Nm per step (208 Nm per Km) to achieve the range of motion required when maximum vGRF of 2g /Kg and 0.20Nm.Kg per step (or 150 Nm/Kg per Km) to achieve the range of motion required for a maximum vGRF of 4g /Kg. Thus , at a pace of 4 m/sec the repositioning cost is only a minor fraction of total energy cost and, furthermore decreases as time on stance decreases, strengthening the conclusion that a short time on stance is more efficient. The decrease in re-positioning cost when time in stance is shorter reflects a smaller range of motion and a longer airborne time in which to achieve repositioning thereby allowing a lesser acceleration. I have not performed the corresponding measurements for cadence 180 and 200 steps per minute at maximum vGRF = 3g /Kg. Although range of motion is less when cadence is higher, airborne time proportionately reduced demanding higher acceleration so it unlikely that the smaller range of motion required at higher cadence will offset the effect of a greater number of steps per Km. I will perform further measurements of the costs of limb repositioning in the near future. Whatever the outcome of these measurements, the fact that repositioning costs are only a minor proportion of the total at a speed of 4 m/sec makes it unlikely that further measurements will appreciably alter the strength of the conclusion that it is more effect to run at a higher cadence. In an article in the Journal of Physiology in 1977 (volume 268, p467), Cavagna and Kaneko estimated the energy required to reposition the limbs based on measurement of limb movement derived from video recordings of runners. They conclude that it exceeds the energy associated with overcoming external forces at speeds above 20 Km/hr (5.55 m/sec). However, they acknowledge that there are many uncertainties in their calculations. Nonetheless when estimating energy costs at high speed it is likely to be important to take account of re-positioning of the limbs. Actions such as flexing the knee of the swinging leg so that the lever arm is short would be expected to have an appreciable effect at high speed, but probably matters little at speeds of 4 m/sec or lower. What determines the upper limit of cadence? While, I am confident that the mechanical work required to overcome braking and elevate the body decreases as cadence increases, this does not prove that metabolic efficiency will continue to increase with increasing cadence. In estimating the relationship between mechanical work and metabolic cost of running, we had to take account of two variables: the efficiency with which muscles convert metabolic energy to mechanical work, which is typically about 20%, and the proportion of energy that can be recovered via elastic recoil. As cadence increases, there will come a point at which the contraction becomes less efficient, and in addition, it might also be expected that recovery of energy via elastic recoil will also diminish. Hence there will be an upper limit to the optimum cadence. I suspect that the upper limit will be determined by the peak rate at which muscle can generate the tension required to capture kinetic energy and convert it to elastic energy. The observation that elite 5Km and 10Km runners tend to exhibit a cadence in the range 180 to 200 steps per minutes suggest that the peak is around 200 steps per minute. Overall, my calculations indicate that efficiency is greatest when time on stance is short and cadence high. It is current folk lore among runners that you should land under the COG. That is impossible, when running at constant speed except when running into a strong wind, because the push from hGRF when the point of support is behind the COG would inevitably cause continued acceleration. However the twin principles of short time on stance and high cadence are the principles that allow the runner to minimise the amount the foot is ahead of the COG at footfall. These calculations simply use the principles of physics to explain why Tirunesh Dibaba runs like this. 1) How much does a change in the time course of vGRF from that typical of a forefoot runner to that typical of a heel-striker affect the energy costs. 2) Does the increase in angular momentum around the pivot at the point of support, due to the effect of gravity, play an appreciable role in the presence of wind resistance. 3) What are the implications of these calculation for risk of injury and in particular, for the potential benefits or costs of barefoot running? You are currently browsing the Canute's Efficient Running Site blog archives for February, 2012.